Hi friends! It’s Nicole again from Birkley Lane Interiors where I help women solve their decorating problems. I’m so excited to be with you again! I love sharing decorating ideas with you, like my DIY Pom Pom Wreath and my Fixer Upper Throw Pillow shopping guide. 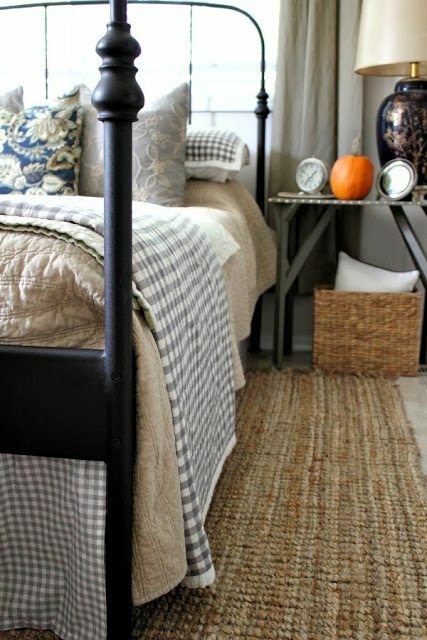 Today I’m sharing some amazing farmhouse bedroom ideas! I’m always looking for new and stylish ways to add farmhouse style to my home, and these rooms do not disappoint! 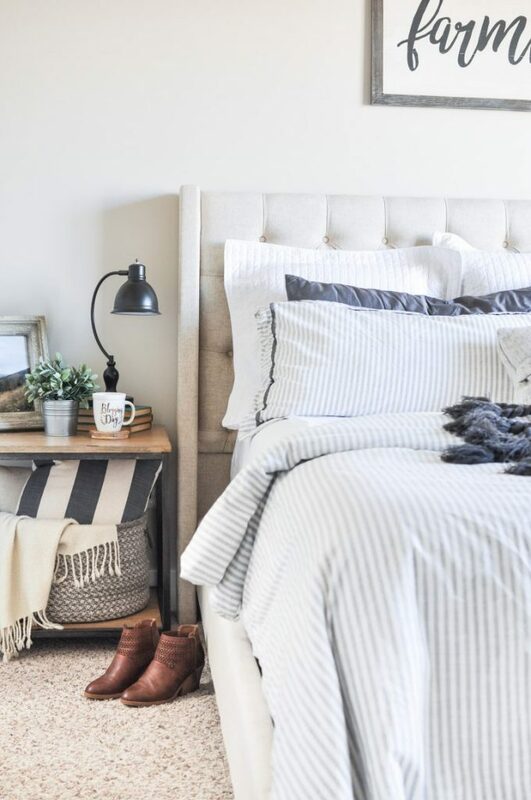 If you’re on the hunt for some farmhouse accents for your bedroom, be sure to check out our shopping guide to help you out! The thing I love most about the farmhouse style is how diverse it is. There are so many different styles within the farmhouse look! These bedrooms will give you lots of different and stylish farmhouse bedroom decorating ideas! 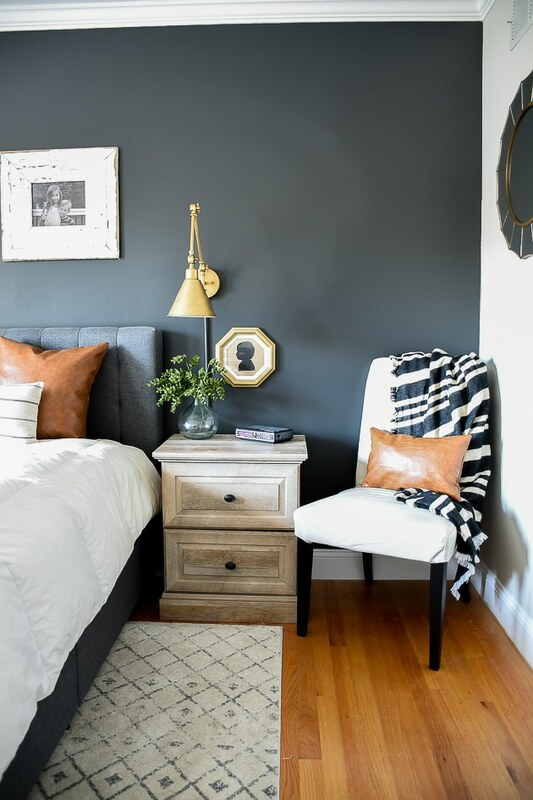 I love this farmhouse master bedroom from the Lauren McBride Blog! I love the little sitting area she created by the window. See the full room here. 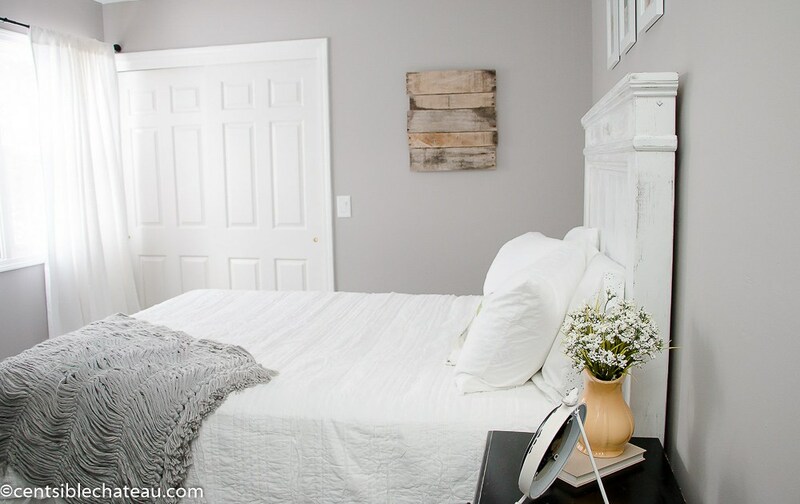 This is such a great farmhouse bedroom makeover from Christina’s Adventures! I love the mounted lighting she used and the sweet quotes on each side of the bed, great ideas for farmhouse bedroom wall decor! See the full room here. I’m loving the fun colors and texture The Shabby Creek Cottage used in her farmhouse bedroom makeover! Lot’s of farmhouse bedroom decorating ideas! See the full room here. 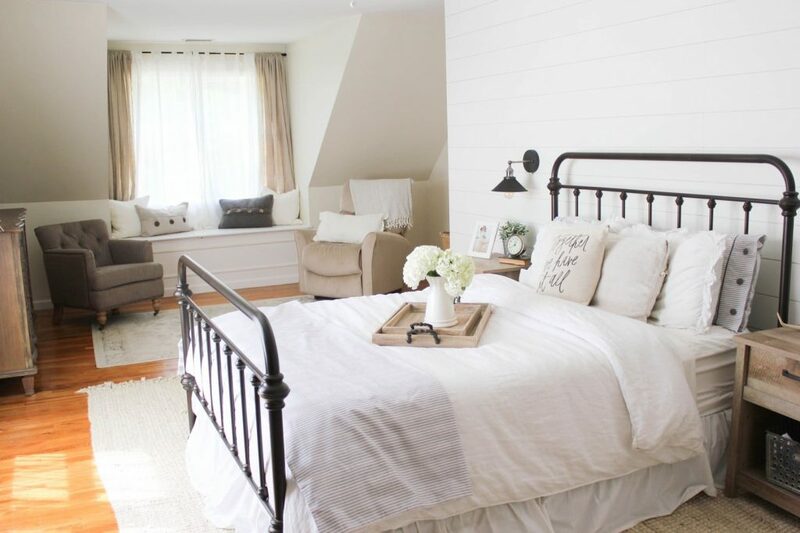 I love the simplicity of this farmhouse bedroom from Farmhouse on Boone. There’s no better wall decor than some shiplap! See the full room here. Twelve on Main has lots of farmhouse bedroom ideas! They did a massive master bedroom makeover, and created a soft, creamy farmhouse bedroom! See the before and afters here! Sometimes, less is more and Simply Kierste is a master at creating a simple and beautiful room. 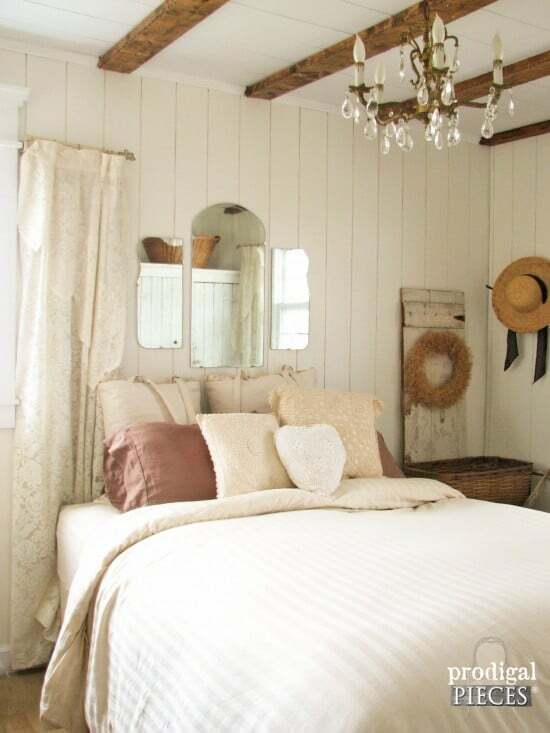 Get more of her farmhouse bedroom ideas here! 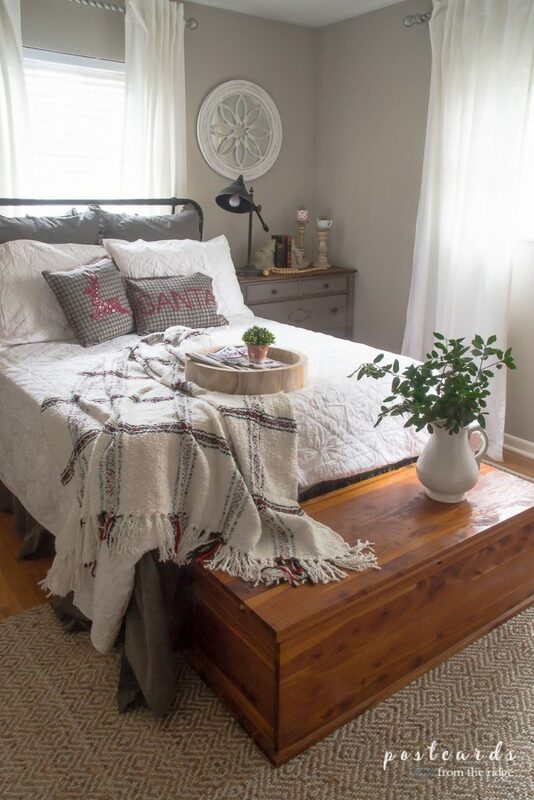 Postcards From the Ridge created a beautiful farmhouse bedroom that can easily be changed up with some holiday accents! See the full room here. 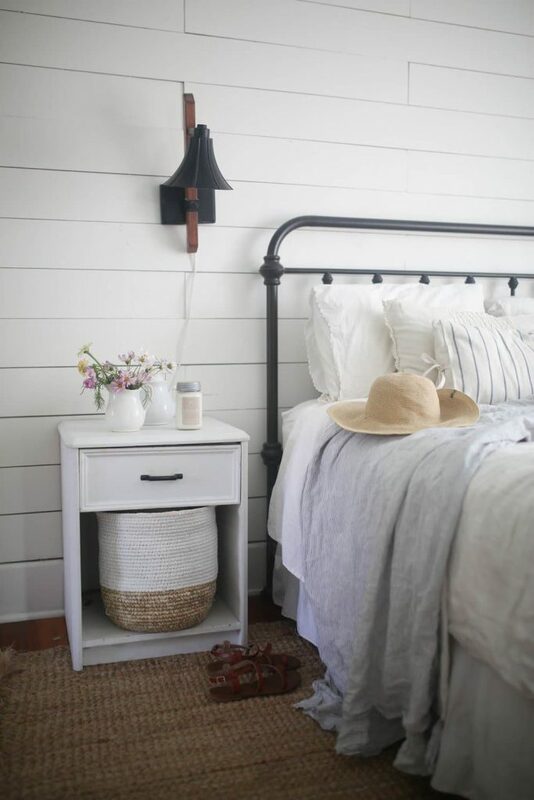 I love these farmhouse bedroom ideas from Little House of Four! That dark wall is to die for! 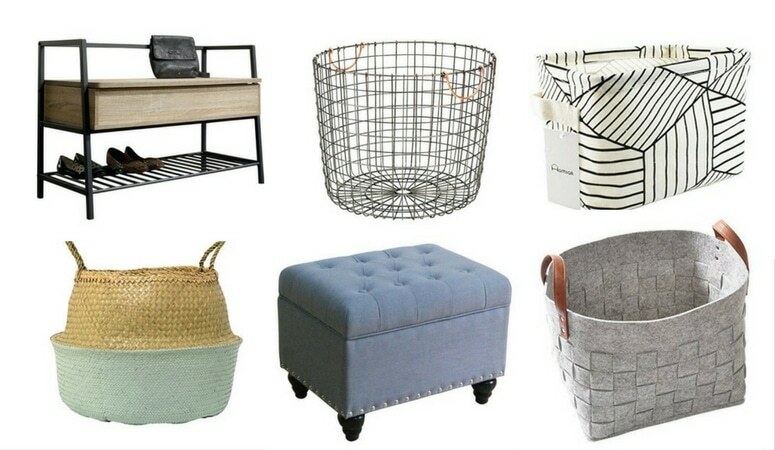 Its the perfect accent for modern farmhouse decor! See it here. 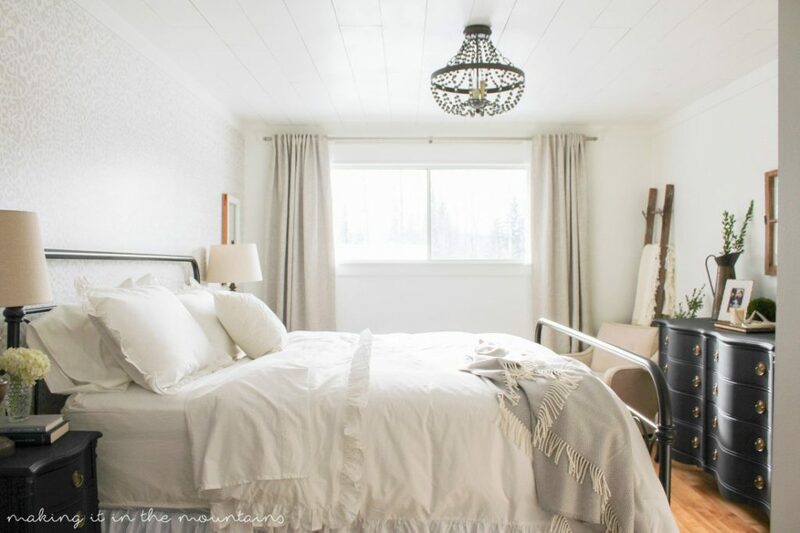 Making it in the Mountains created a lovely, light farmhouse bedroom. 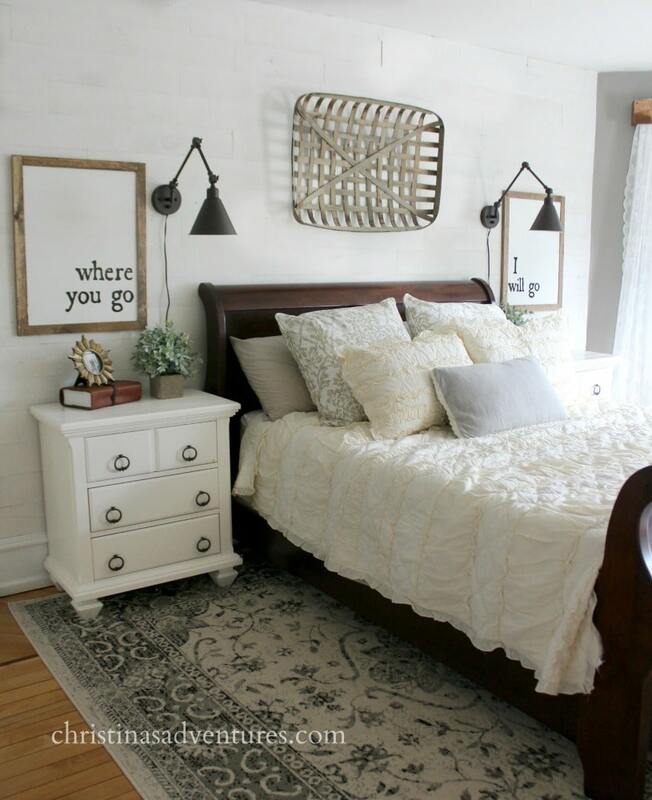 Check out her post for more farmhouse bedroom decorating ideas! 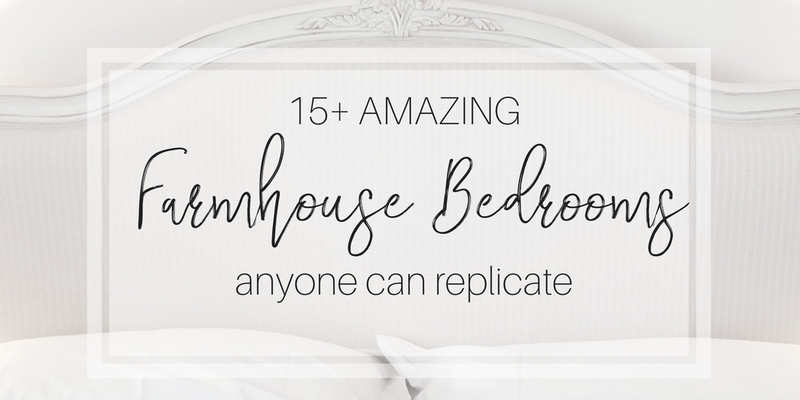 If you’re looking for simple farmhouse bedroom ideas, My Life from Home does a great job! I love that beam they added to their ceiling!! It brings the whole room together. See it all here. If you’re looking for a country farmhouse style bedroom, look no further than Prodigal Pieces! 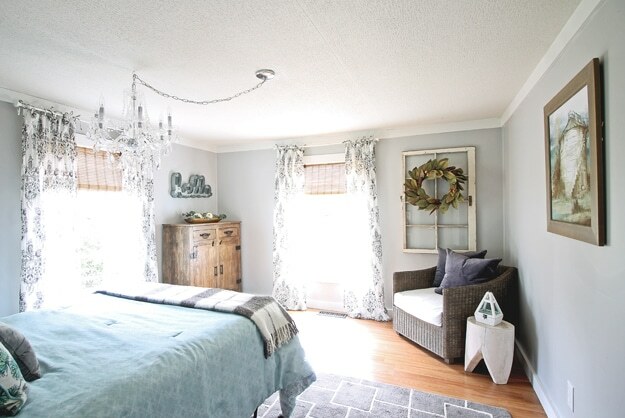 She did a beautiful job creating a cozy, country bedroom! See it here! When you’re looking for farmhouse bedroom ideas, do what Cherished Bliss did and focus on your bedding! Love how the headboard and bedding really changed the look of their room. See it all here. 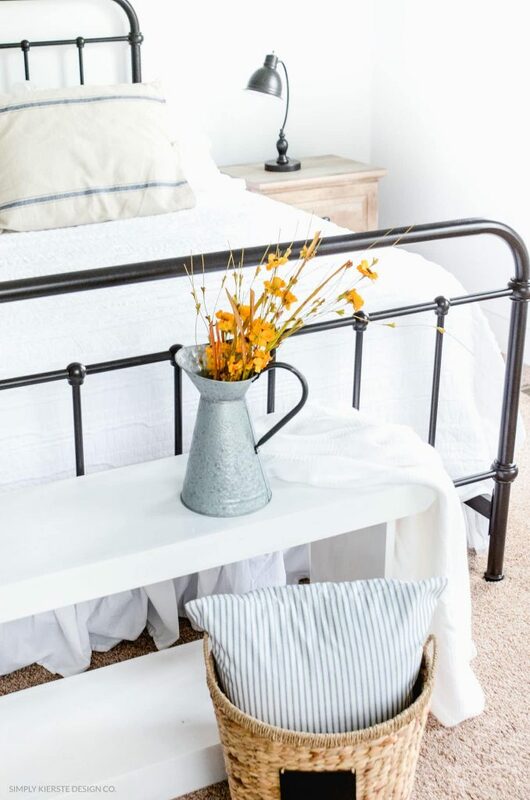 Love the blues that Blooming Homestead used in their farmhouse guest bedroom! See the full room here. 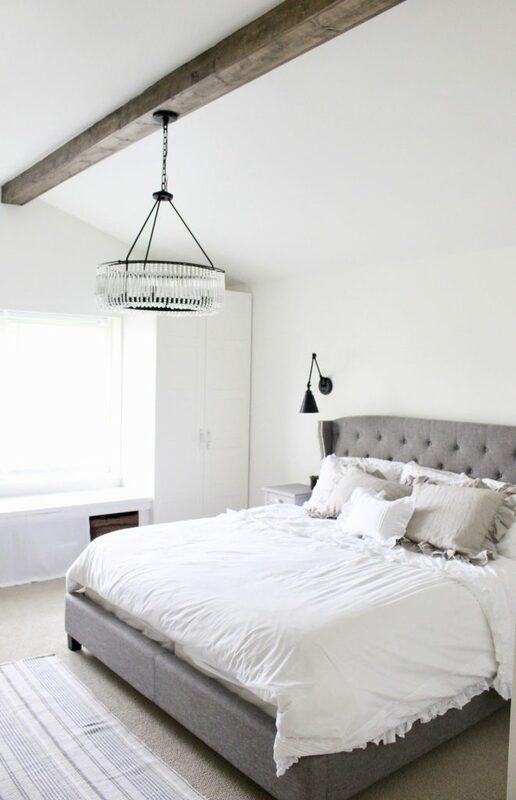 Creek Line House does a great job of incorporating texture into their farmhouse bedroom. The rug, basket, and bedding all play a part. Check out her blog for more tips! 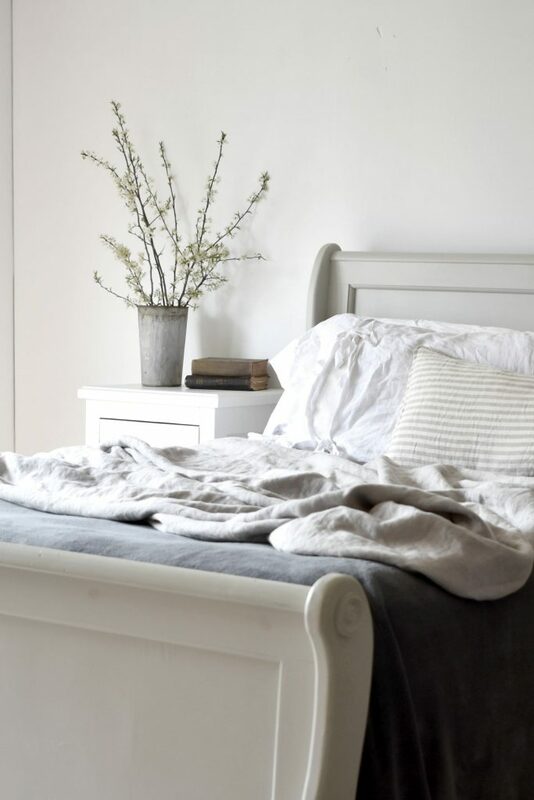 When you’re searching for farmhouse bedroom decorating ideas, chances are you’ll come across a lot of white! That’s because nothing says farmhouse style quite like white does! 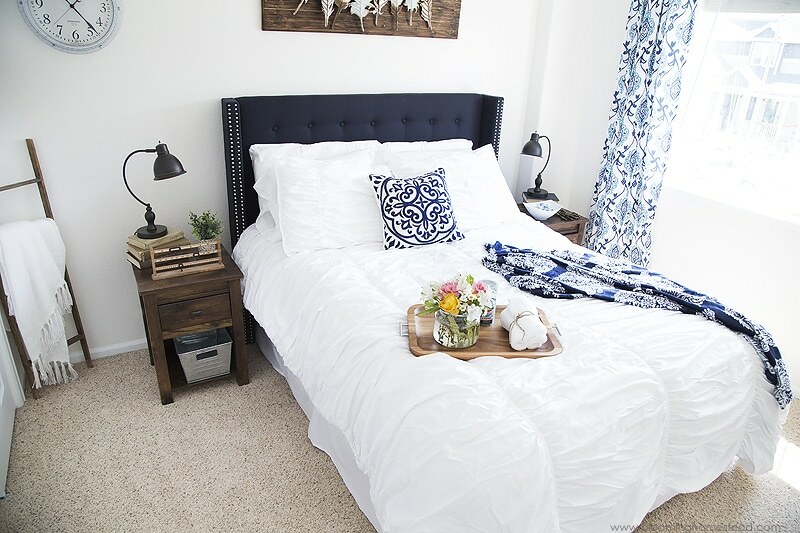 Centsible Chateau does a great job using white in her bedding and decor! See it all here. 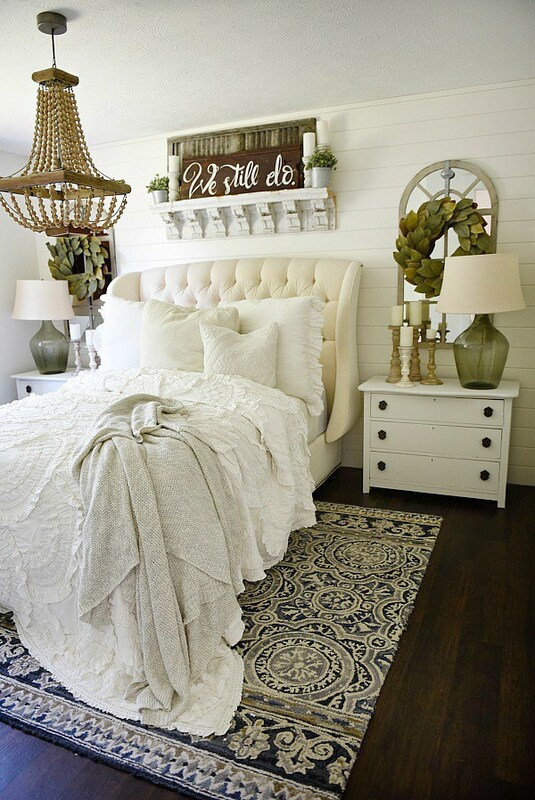 Liz Marie Blog uses some amazing farmhouse bedroom wall decor! I love the feminine look she created! See the full room here. 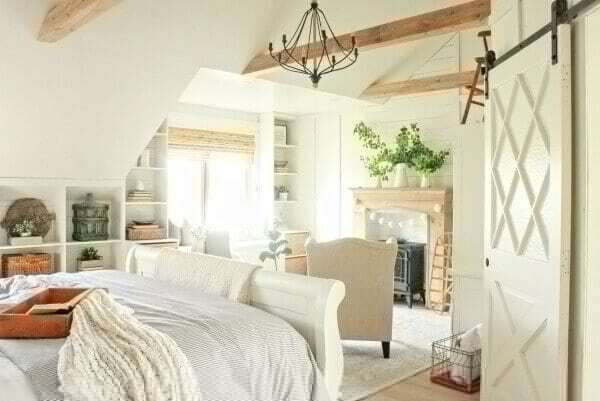 I Love the simple creams Flat Creek Farmhouse uses in their master bedroom! The pop of color with her bedding really brings it all together! See the full room here. Do you have a favorite bedroom?? There are so many that I loved, it’s hard to choose one! They each had some amazing ideas. Be sure to check out this farmhouse bedroom design for even more inspiration! 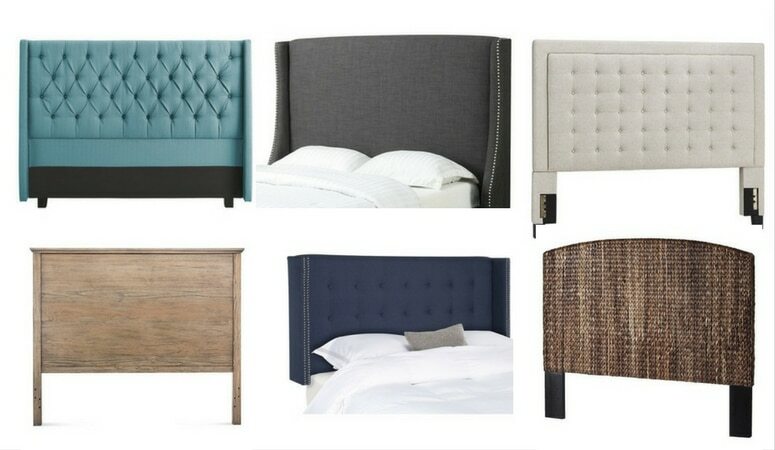 If you liked this post, be sure to check out 20 Gorgeous Headboards for Your Bed, 50 Stylish Storage Options and How To Mix Patterns Like a Designer!